Check Out This Incredible 14 Story Graphic in Michigan! 22 Mar Check Out This Incredible 14 Story Graphic in Michigan! 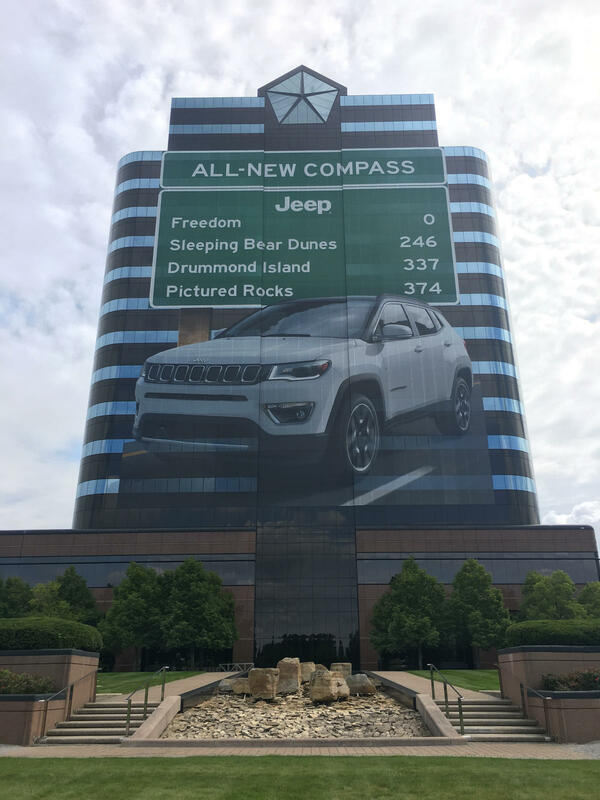 From rookies to the master level wrappers, every vehicle wrap installer is fascinated by an incredible fourteen story high graphic which has been installed in Michigan. I. M. Branded has engraved and installed this Herculean piece of the graphic at FCA (Fiat Chrysler Automobiles) company headquarters, Michigan. M. Branded is a graphics and millwork association located in Michigan. They have been in the industry for more than 2 decades. They specialize in assisting automobile dealership agencies to maximize their visibility and influence on their potential customer base. Technologies of artwork and craftsmanship, refinement of installation procedures, candid connections with the topmost internationally renowned automobile manufacturing companies, etc. enhance the capability of I. M. Branded to give OEM (Original Equipment Manufacturer) certified millwork and graphical acknowledgment to numerous vehicle dealership agencies all over the nation. In November 2017, this market-leading, first-class company installed the enormous building wrap at FCA main office in the United States located in Auburn Hills, Michigan. This graphic wrap occupies about a 20,000-square foot surface area of the building covering up to fourteen stories in height. The establishment is visible to a roughly predicted number of 136,000 drivers daily starting with the I-75 highway located close-by. This graphic design is manufactured by I. M. Branded while Union Ad Works formulated the original design. The design featured the Chrysler Jeep Compass 2018 model which covered 19,206 square foot surface to be exact. The state-of-the-art HP 3500 printer used by I. M. Branded has been used to print the whole graphic. The company took only 3 days to complete the entire building wrap installation with amazing success. Starting from 1999, for FCA’s US-based headquarters, I. M. Branded has manufactured over twenty gigantic pieces of graphics with successful installations. These graphic works featured various models of Jeep and Chrysler cars that have been showcased on the surface of the office building for motorists and passers-by. Jim Whitehead, the president of I. M. Branded was thrilled and more than satisfied with the company’s capability of producing graphics of this magnitude with great detail and precision. These gigantic yet enjoyable graphics assignments have always been huge challenges for the company and the operational team. Along with the audiences, the company members really have been entertained and pleased to see their complete projects on the FCA Headquarters’ superstructure after going to great lengths to design and install this incredible graphic. I.M. Branded is one of the leading companies in the graphics and wraps industries. They have produced a wide selection of customized graphics works, millwork and visuals considering OEM automobile corporations and dealerships. Excellently constructed wraps with innovative and HD LED light system and radiance featuring specifications have always been the area of expertise of this company. According to Whitehead, they are continuously contributing to investments for innovation of ultramodern materials and advancement of related instruments and technologies. In the ever-changing world of graphics and marketing, it is essential to produce long-lasting and positively influencing impressions on potential customers. The creation of truly unique graphics like the one at the FCA headquarters in Michigan proves that the wrap and graphics industry is absolutely one to watch for future groundbreaking marketing options.